For more long-term advertising contracts, perhaps at a community ice rink, it is essential to use a media that can withstand the cold for extended periods, survive knocks and abrasions, and can be removed cleanly at the end of its life. It is not just the official NHL arenas that sell board advertising, either. Many community and local ice rinks build revenue this way, too. These installations may be more long-term seasons, but it is all business for local board display printers. Put simply: there are a lot of advertising boards to print! As a printer, the big question is “How does one get their piece of the rink board advertising action?” For league-wide sponsors and advertisers, the sales and printing are handled by the NHL. Generally, these are done centrally and then sent out to the local rinks and big arenas for game time. This print is often facilitated by brokers who work in conjunction with larger print shops. For local sponsors and regional advertising, the team franchise or arena, depending on ownership structure, will facilitate the sales and production through their marketing departments. This varies city by city, but is usually printed locally for the organization for them to install in-house. Once a company’s print sales reps are engaged with the proper people at the team level, they can discuss local structure and processes for the print fulfilment. They are likely to uncover other print jobs within the organization and team structure. For instance, it is not just the 31 NHL teams to consider. There several minor professional and junior leagues that are doing in-house advertising on their rink boards that open up more opportunity. The American Hockey League (AHL) and the East Coast Hockey League (ECHL) are development leagues for the NHL and are affiliated with individual big-league teams. Together, these two leagues have another 58 teams throughout Canada and the United States. The major junior league, overseen by the Canadian Hockey League (CHL), has an additional 52 teams in Canada and eight teams throughout four Northern U.S. states. There are also countless junior teams and amateur leagues who play in local arenas across North America who are looking for advertising revenue. Further, when considering the many tournaments and special events which require branding and rink board ads, one has a huge printing opportunity. Most rink board advertisements are simply big corporate logos; therefore, it will be necessary to hit a number of specific Pantone or branded colours to ensure the sponsors’ brands are properly communicated. Once this business has been secured, it is important to ensure one knows how to manufacture the rink board advertisements. 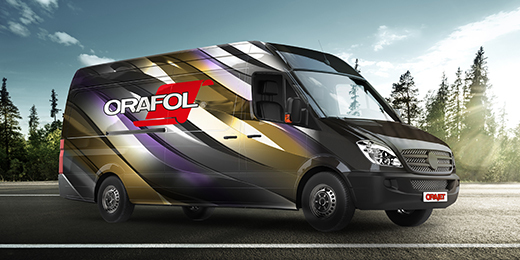 Before one starts to print anything it is vital to make sure the colour management is spot on, and the workflow is compatible with good quality media. 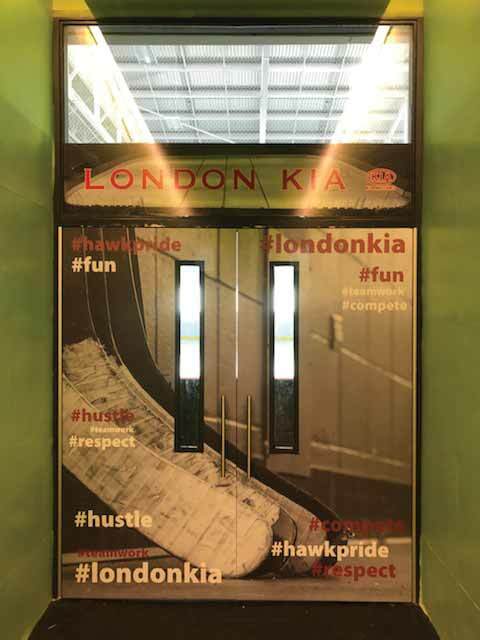 Most rink board advertisements are simply big corporate logos; therefore, it will be necessary to hit a number of specific Pantone or branded colours to ensure the sponsors’ brands are properly communicated. The rink board advertisements in NHL arenas are normally installed before each game and are only used once. In many circumstances sponsors will only purchase enough ad time for less than a game. In these cases, the decals are removed and replaced with a different sponsor between periods. 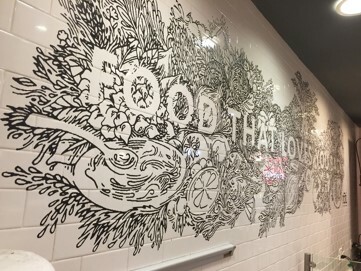 When selecting a self-adhesive vinyl to print it is important to ensure the correct media is used for its intended surface, longevity, and printing technology. The adhesive must stick well and apply easily at the lower temperatures one would expect near ice level, but be compatible with quick, clean removal—even during a game—leaving no sticky residue behind or damaging the boards. 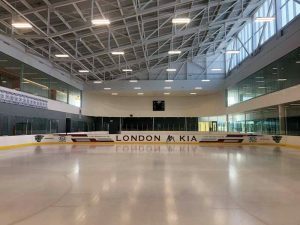 For more long-term advertising contracts, perhaps at a community ice rink, it is essential to use a media that can withstand the cold for extended periods, survive knocks and abrasions, and can be removed cleanly at the end of its life. Further, the right media should be opaque in order to cover up blemishes and ensure there is no bleed-through if decals are installed one over another, or if the boards are marked, which is highly likely in an ice hockey environment.